Should we silence the insensitive? So for three days running, a top story on all the news sites was the chimpanzee who ran amok and tore off somebody’s face, and was then shot for his trouble. It was eclipsed only by the ongoing story about the federal stimulus package and its myriad shortcomings. So you’d think that when a cartoonist attempted to play off both headlines, the result would be polite yuks at best, bored shrugs at worst. Then again, this is America, where Al Sharpton remains at large and the only thing we have more of than bad debt is sweet, sweet outrage. Sharpton was among the professionally aggrieved who looked at the cartoon Wednesday and perceived in it the specter of racism. The president of the National Association of Black Journalists, evidently unaware of the 24/7 coverage of the rogue chimp, saw a direct racial caricature of President Obama. A New York state senator saw a tacit endorsement of assassination and fond nod to the days of lynching. And those were the more moderate interpretations. Look, I know I’m not black and therefore my opinion on this worth exactly nothing. 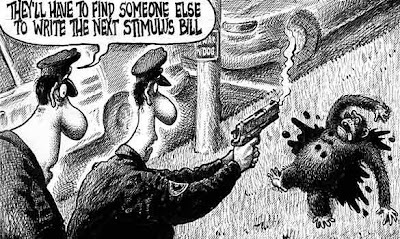 But here’s what I see: a cartoonist suggesting, none too subtly, that the stimulus bill is so imperfect it might as well have been authored by a crazed lesser primate. I don’t need to point out that the authors include both houses of Congress as well as the president. As political criticism and satire, it’s perfectly legitimate. Other presidents have fared much worse, and Obama probably will too. Remember those Dutch cartoons about Muhammad, and how so many Muslims the world over went so laughably berserk? By rampaging over a caricature, they became caricatures themselves. It’s probably too late for Sharpton, but the others tearing out their hair over a dumb cartoon should give that some thought. Do you remember the film Brewster’s Millions when Richard Pryor has to spend $30 million in 30 days to inherit his uncle’s $300 million, but must have nothing concrete to show for it? A newspaper yesterday suggested our UK PM Gordon Brown for Pryor’s part in any remake. How long before President Obama gets the part or is he still on honeymoon with the electorate? I agree with you, but you have to admit that referencing a monkey in any relation whatsoever to Obama or his stimulus bill is just plain dumb. Oh, you are so right! It was funny! Perhaps the people who read too much into it have no idea what satire is or they’re just looking for another way to protest over what they think is a slam. I think they “doth protest too much”. Even though this is a humorous and creative political cartoon, and my initial interpretation was right on with yours, I would say it is a bit shortsighted to associate a monkey in any way with President Obama. For one, there’s the discipleship following that he’s amassed, and two, I swear there are people on the look out for anything that might be the least bit, kind of, sort of, maybe implied or inferred (even if it’s a stretch) as racist so they can jump all over it and brand it racist and degrading. So why set the bait? You know people are going to bite. Unless that’s what they wanted…but I doubt it. And I don’t blame anyone for being outraged about a cartoon. Graphic images are powerful and this controversy is more proof of it. I just wish certain newspapers understood that when it comes time for layoffs! Hey, I never said it was a good cartoon. But I’m a lot less queasy about perceived racism than I am about all those chanting to shut down the Post and hang (figuratively) the cartoonist.